You can read the full report in the SlideShare embed below, but read on for my in-depth analysis and commentary on the most important findings. 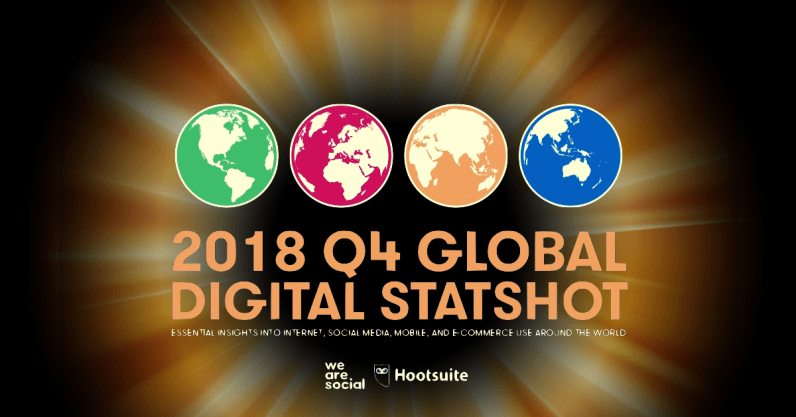 There are almost 4.2 billion internet users around the world in October 2018, up seven percent since this time last year. Shopping behaviors vary slightly between men and women, with women more likely to use a shopping app on their mobile compared to men. And speaking of search, GlobalWebIndex’s latest data shows that people are increasingly turning to voice to help them find what they’re looking for. 38 percent of internet users surveyed around the world in Q2 report using voice-enabled features in the past 30 days, and that figure jumps to incredible 45 percent and above when we zoom in on users below the age of 35. Privacy fears have been a recurring theme throughout 2018, so I’m pleased to include some new insights from Statista in this new report. The company’s most recent Global Consumer Survey found that 42 percent of the world’s internet users fear that their data is being “misused” online, although – once again – there are some significant differences across cultures. Mark Zuckerberg probably won’t remember 2018 among his favorite years, but Facebook continues to grow its global user base despite the various scandals and setbacks that the company has faced over recent months. Recent algorithm tweaks seem to be working in Facebook’s favor, with the number of pages investing in paid media increasing by four percent in the past three months. Furthermore, if previous years are any indication of a ‘pattern’, it’s likely that Facebook will introduce yet more changes to its algorithm in early 2019, and it’s unlikely that these changes will work in brands’ favor. As a result, my advice to marketers would be to take a more ‘balanced diet’ approach to social media in their plans for next year, and to avoid putting all of their eggs in one (Facebook) basket. You’ll find detailed breakdowns of the potential advertising for each of Facebook, Instagram, Twitter, LinkedIn, and Snapchat in the report embed at the top of this post.